Odessa, Mo. 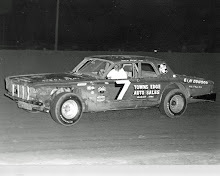 (July 27, 1974) – David Goldsberry of Bolivar, Mo., coasted to victory at I-70 Speedway’s National Championship 300, banking more than $4,500 in prize money. Goldsberry’s battered blue and gold 1972 Chevelle ran perfectly and had a three-lap lead on the second and third place cars on lap 294 when sparks began spewing out of his car caused by a flat on the left front tire. The car slowed, but Goldsberry had full control and maintained a good pace. The real issue developed when he took the white flag, signaling the last lap. Goldsberry’s car began running out of gas, going slower and slower around the half-mile. 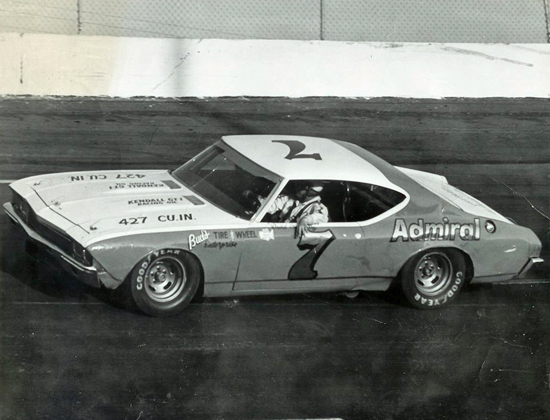 Freddie Whisler of Independence, Mo., driving a 1973 Camaro, was really flying and manage to pass Goldsberry twice, but he needed to pass him one more time. 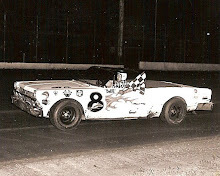 As flagman Kenny Austin furiously waved the checkered flag, Goldsberry’s Chevelle inched closer and closer to the finish line, stopping just a car length over the finish line as Whisler came flying by just a few seconds too late. 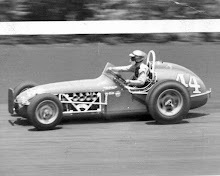 Whisler would settle for second while Joe Ruttman of Dearborn Heights, Mich., took third and Bob Williams of Independence, Mo., grabbed fourth. Bob Senneker of Dorr, Mich., who set fast time in qualifying at 18.02 seconds, and also won the qualifying feature on Friday night, led the first 34 laps before a blown tire caused him to slow abruptly on the backstretch, and Joe Wallace of Peyton, Colo., who had been drafting him, bumped him from behind, sending the two drivers spinning into the infield. Goldsberry would become the new leader on the restart and would lead until lap 80 until the next caution came out. Ruttman would take over the top spot on the next restart and begin setting a torrid pace. He pulled away from the rest of the field was really pouring on the power. The yellow flag would come out again on lap 103 as Roy McClellan of Riverside, Mo., and Dean Ayres of Platte Woods, Mo., collided. The red flag was waved to clean up debris an Ruttman pulled into the pits for fuel. A crewman of Ruttman’s spilled some of the high-octane gas and thee car was engulfed in flames. Quick work by the track safety crew put out the fire and no one was injured. Ruttman was back in the race for the restart and continued to lead. Larry Phillips of Springfield, Mo., would take the lead from Ruttman on lap 107 but a pit stop for Phillips gave the lead back to Ruttman. On lap 138 Ruttman pitted during a yellow and Goldsberry took the lead again. Following the restart, Goldsberry really mashed down on the accelerator and he and his Chevelle started to widen the margin. He would continue to lead and by the time the race had moved into the third half, Goldsberry started lapping the field. 1. David Goldsberry, Bolivar, Mo. 2. Freddie Whisler, Independence, Mo. 3. 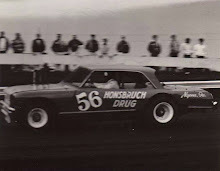 Joe Ruttman, Dearborn Heights, Mich.
4. Bob Williams, Independence, Mo. 5. Dean Ayres, Platte Woods, Mo. 6. Don Schoenfeld, Fort Smith, Ark. 8. Bob Senneker, Dorr, Mich.
9. Jack Constable, Princeton, Mo. 10. 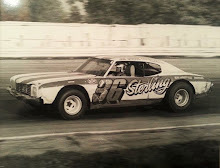 Terry Brumley, Springfield, Mo.